Burke Urban’s commitment to the Adelaide Hills is officially cast in stone! Newenham, our spectacular new residential estate on the outskirts of Mount Barker, will soon become home to an equally remarkable stone sculpture – and the starting point of a seven-stop mini sculpture trail though the town. 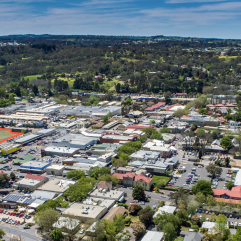 That’s because we have joined forces with the Adelaide Hills International Sculpture Symposium (AHISS) to commission one of the works which will be created by innovative Chinese sculptor, Liu Yang. 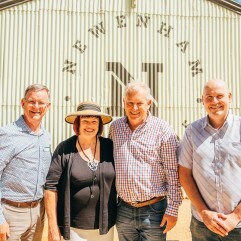 It will be crafted specifically for the Newenham setting, blending with the project’s theme of delivering urban tranquillity and modern Australian living in a beautiful, timeless setting to enrich the health, happiness and wellbeing of the whole community. 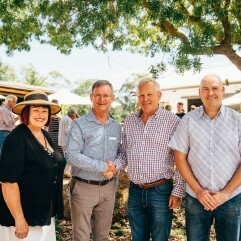 AHISS patron and Governor of South Australia, His Excellency the Hon Hieu Van Le AO officially opened the 2016 AHISS at famed South Australian artist Hans Heysen’s Hahndorf home, The Cedars, at the launch event on April 6. The Symposium will run at The Cedars until April 25, during which time eight carefully-chosen sculptors – one from Australia, a couple from our neighbour New Zealand and the remainder from countries as diverse as the UK, China, Korea, Bulgaria, Holland and Italy – will set up residence in the homestead while chipping away at their monolithic creations. The Symposium is open to the public daily so you will be able to drop by to see them at work and we’ll make a point of keeping you updated on Liu Yang’s progress. 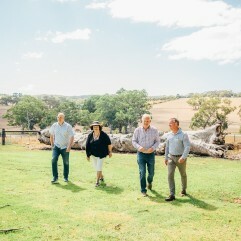 When complete, the entire Hills Sculpture Trail will extend from Milang to Mount Torrens, with 26 sculptures spread across the stunning Adelaide Hills and Fleurieu Peninsula landscape and linking regions, art and people. A ‘mini’ trail can be easily followed, starting at Newenham then taking in two sculptures in Keith Stephenson Park before meandering past another at Auchendarroch House and winding its way down the length of the main thoroughfare, Gawler Steer, with a sculpture at each end and concluding at Williams Road. We are very honoured to be involved and can’t wait for you to see this world-class creation. For more information on the Symposium, please visit www.adelaidehillssculpture.com.au or visit The Cedars at Hahndorf between April 4 – 25 to see the artists in action.